Ming-Li looked up and tried to imagine the sky silent, empty of birds. It was a terrible thought. Her country's leader had called sparrows the enemy of the farmers--they were eating too much grain, he said. He announced a great "Sparrow War" to banish them from China, but Ming-Li did not want to chase the birds away. Sara Pennypacker is the author of the acclaimed Clementine series, illustrated by Marla Frazee; Stuart's Cape and Stuart Goes to School, both illustrated by Martin Matje; and Dumbstruck. Sara lives in Cape Cod, Massachusetts. Yoko Tanaka made her children's book debut with Theodosia and the Serpents of Chaos by R.L. LaFevers. Before graduating from Art Center College of Design in Pasadena, California, Yoko won a Gold Award from the Society of Illustrators in Los Angeles. Her work has been featured in several magazines, and in galleries across the globe. 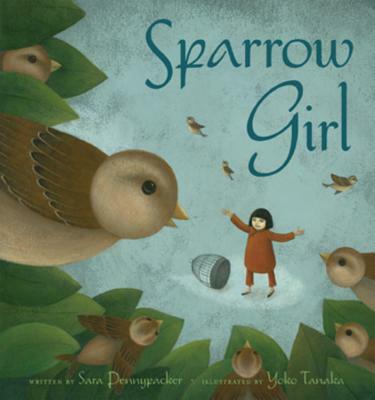 Sparrow Girl is her first picture book.